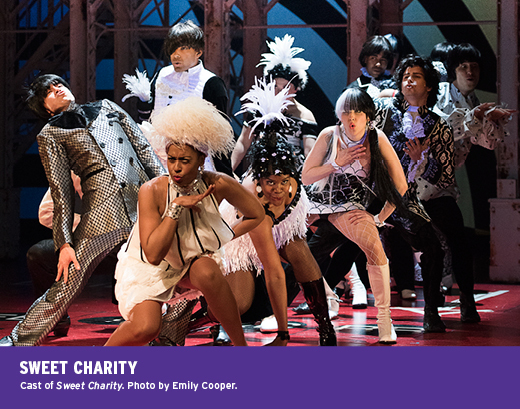 On the face of it, Sweet Charity must have seemed like an obvious choice for the Shaw Festival’s big musical this year. It was a huge success for legendary choreographer and director Bob Fosse and his partner Gwen Verdon, when it was first staged on Broadway in 1966. 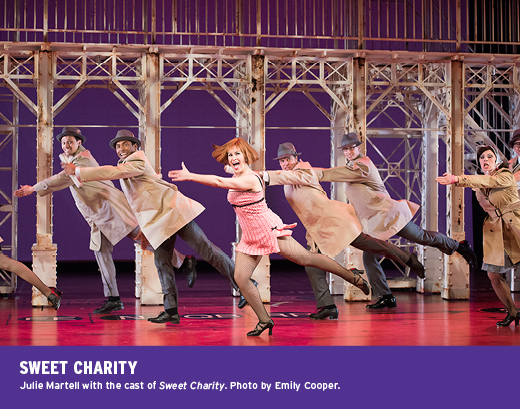 Sweet Charity has a hit-laden score by Cy Coleman and Dorothy Fields, with such memorable numbers as “Big Spender,” “I’m a Brass Band,” and “If My Friends Could See Me Now.” And it has a great leading role for an actress: Charity Valentine is just the kind of outsized character who can charm audiences and make them love the woman performing the part. 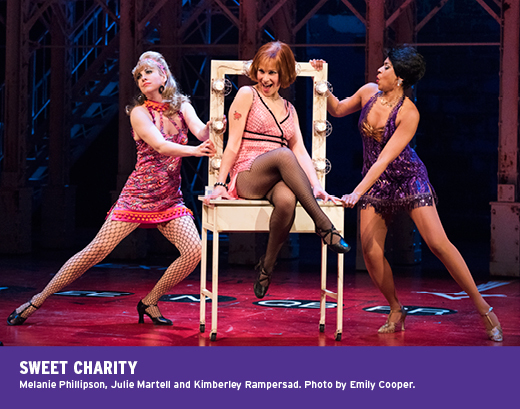 But the years haven’t treated Sweet Charity as kindly as it has Cabaret, another Fosse hit, which was staged last year at Shaw. Fosse’s inspiration for the play was Federico Fellini’s bittersweet hit film Nights of Cabiria, in which a prostitute with a heart of gold miraculously continues to hope for love despite living an existence filled with betrayals and violence. Just as Fellini cast his partner and muse Giulietta Masina as his lead, so did Fosse. 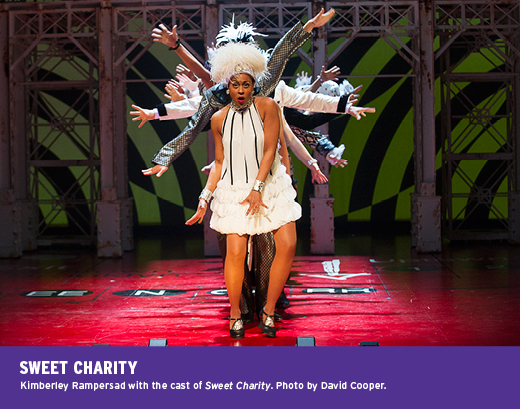 Though Sweet Charity was a hit, there were problems with it that have grown as time has gone by. Broadway audiences wouldn’t have accepted a prostitute as a lead in a musical at that time so Fosse made Charity into a taxi dancer, a job that must have seemed antiquated then and has long since disappeared. Although Fosse retained some of the main episodes from Fellini—the near-drowning in the beginning and the long encounter with a matinee idol—the play never had the unity of character and plot that “il maestro” achieved in what would be his second Oscar winning film. Charity, sweet though she may be, seems to drift from incident to incident, learning nothing while still hoping to meet Mr. Right. This isn’t just a problem with the current Shaw production. The same criticism applies to Fosse’s film version of Sweet Charity, which starred Shirley Maclaine as a fine replacement for Gwen Verdon and Chita Rivera as another dance-hall girl, Nickie. Though the book is attributed to Neil Simon, Fosse tried several other writers (including himself) before staging the show. Simon’s best contributions are in some of the comedic bits between Charity and her lover Oscar and the film idol Vittorio Vidal. The play never did achieve a unity of character and purpose. 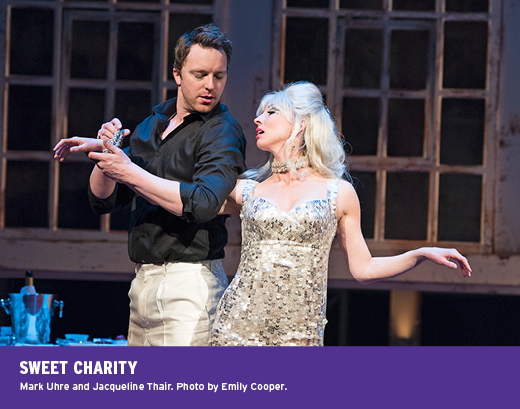 The Shaw’s Sweet Charity does boast a genuinely fine lead, Julie Martell. She dominates the play and is a true musical talent. The cast does well, too—this is Shaw, after all—and in particular, Kyle Blair as the neurotic Oscar and Mark Uhre as Vittorio bring some fine comic timing to their scenes. Shaw’s orchestra is terrific throughout and the musical numbers are tuneful and rousing. Sweet Charity is a musical of its time. You can practically see the embers of the fiery productions of Broadway’s finest era in the play. 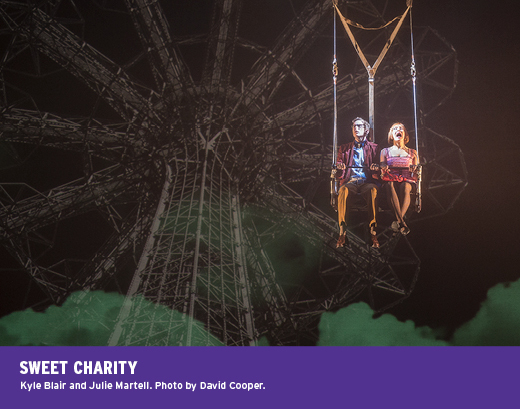 Like Charity, this production is feisty and happy to please with enough artistry and charm to woo most any audience. It’s bound to enchant crowds this summer.